One of the dumbest yet most brilliant ideas humanity has ever had is the day-long motor race. Cars have to run almost flawlessly all day to even sniff the podium. The teams are all ragged and delirious at the end, but they made it, man. Is there any prouder feat? Of course we’re going to watch that, and you should too. The Rolex 24's early spot on the calendar always means there’s something new on hand. This year, there’s a whole class of entirely new race cars, not to mention a bizarro mid-engine Porsche 911 RSR making its international racing debut. With 55 cars running this year, there’s truly something for everyone out on track. The fact that some cars look like normal cars, and some look sort of like that vaporware Faraday Future concept thing with the back-fin can be confusing, though, if this is your first time paying attention to this race. Here’s our guide on the who, what, where, how and why of the great debut of endurance racing in America: the Rolex 24. What’s with all the different cars on track all at once? One of the key parts of the Rolex 24, as with most major endurance races, is that it’s multi-class racing. Here, you have big-budget, purpose-built racing prototypes driven exclusively by professionals sharing track space with moneyed amateurs in relatively normal-looking cars. Prototype (P): The top, fastest class of endurance racing prototypes in North America, geared primarily towards teams of professionals. This class is somewhat based upon the international LMP2 spec, for those of you familiar with the cars that run at Le Mans. However, IMSA and the manufacturers who back its series wanted to allow marques to customize cars more so they wouldn’t be giving mere lip service to branding a car a “Mazda” or a “Nissan.” This birthed the Daytona Prototype International (or DPi for short) spec of cars that runs here, although the regular LMP2s that are eligible to run at Le Mans can also run in IMSA’s P-class. It’s a little complicated, but tl;dr—these are the fastest things you’ll see on track, and they’re incredible both up-close and at speed. Prototype Challenge (PC): Like the P class, PC is all purpose-built race cars that were designed from start to finish for track use—and track use only. These identical open-top cars are run by pro-am teams—in other words, with a mix of professionals and amateurs. This is the last year they’ll be running as a class, thought. These cars have been around for a while, and with more racers preferring a closed cabin for safety reasons, IMSA opted to scrap this class for 2018. Enjoy them while you can! GT Le Mans (GTLM): The GT classes are the ones based on everyday road cars. 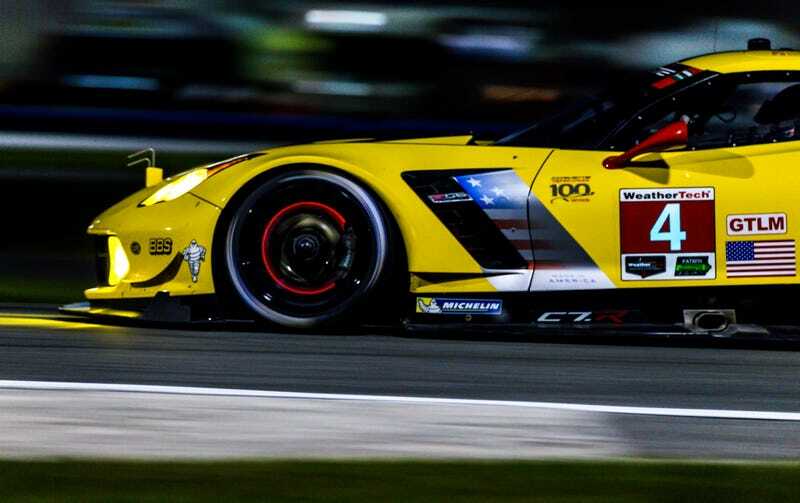 GTLM cars are based on Le Mans’ GTE spec, and are driven by professionals. If you’ve ever wondered what’s possible with a modern-day roadgoing chassis, consider GTLM your weekend dose of inspiration. With cars like the BMW M6, the Porsche 911 and the Ford GT in the mix, this is where the next generation of mid-life-crisis-mobile tech is born. GT Daytona (GTD): Not every amateur wants to race a PC car, and thus, GTD is here to save the day with a collection of everything from Lamborghini Huracán GT3s to the brand-new for 2017 Acura NSX GT3. Like PC, GTD cars are driven by a tightly controlled mix of professionals and amateurs. These cars all adhere to the global FIA GT3 specification, making it relatively easy to buy one from a manufacturer, already race-prepped and ready to go. GTD cars are a little slower than GTLM, but they’re also meant to be less expensive than the spec used by the pros. Of course, who constitutes a “pro” versus an “am” is a hot mess of a debate in its own right, and there’s a lot of incentive to ask for a lower status than you actually deserve for bizarre political reasons you can read all about here. Many of the so-called “amateurs” (which include a five-time winner of this race!) are actually pretty good! Part of the reason for so many classes comes down to sources of funding—as in, it’s often an amateur with cash that keeps a team afloat, and those amateur drivers need a place to play with cars more suited to their non-pro status. The bigger picture, regardless of how team personnel shakes out, is that you’ve got a ton of different cars all competing on the same track at once. You may wonder how anyone can sit down and watch hours of racing, but to me, it’s the ultimate treat for someone with the attention span of a gnat. There’s always something going on, and barely time to take a breather before there’s another rad pass/close call/insane flyby/etc. to marvel at. It’s like having four races within a race, with the winners of each class getting one of those coveted Rolex watches. The overall win is a special feat, however, with many favorite poster cars in race trim running around GTD, it’s a really special thing to see your favorite dream car win its class. What’s so special about the Rolex 24? Endurance races have happened in some form at Daytona International Speedway for nearly its entire history, since 1962. It’s held on Daytona’s 3.56-mile road course, and there are no breaks to give anyone a chance to catch up, or fix their cars. Many consider it to be one leg of the Triple Crown of Endurance Racing—the three most grueling endurance races in the world—alongside the 12 Hours of Sebring and the 24 Hours of Le Mans. It’s also North America’s only full-24-hour-race. What sets Daytona apart from every other major endurance race on the planet is that most of its road course makes use of the big superspeedway banking, which enables these cars to go to plaid around the big oval. Because it’s so early on the schedule, this is where many new race cars make their debut. This year, in addition to all of the new prototypes for IMSA’s own Prototype class, we’ve got the competition debuts of the new Porsche 911 RSR—yes, the freaky mid-engine one—and the Acura NSX GT3. These are the cars that will race all over the world, and we’re seeing them here—in Florida of all places—first! Fans camping out in the infield and around the track turn it into a weekend-long party, and you’ll see everything from incredible rare cars to traditional Floridian debauchery. With NASCAR legend Jeff Gordon coming out of retirement to drive a Cadillac protoype, there’s no shortage of eyes on this year’s race. With so many new cars, we’re all wondering not only which one is the fastest, but which one is built well enough to handle a full day of continuous racing. Will the new 911 RSRs work, or was it just never meant to be a mid-engine car? And is that new Acura NSX GT3 as fast as it looks? Here’s where we find out. Everyone’s eyes are on Gordon’s team, the No. 10 Wayne Taylor Racing squad, for reasons that go beyond the sweet new ride. Not only are we glad to see Gordon still enjoying his so-called “retirement” by still racing awesome cars, but he’s on a fan-favorite team filled with lovable goofballs. Brothers Jordan and Ricky Taylor are two of the funniest drivers on the grid. Jordan has spent much of the offseason trying to fool people as superfan alter-ego “Rodney Sandstorm,” which didn’t fool his Daytona teammate Gordon in the slightest, but was hilarious anyway. Gordon isn’t the only person who’d be recognizable to fans of other series. Porsche 919 driver Brendon Hartley is driving for the Tequila Patrón ESM Nissan prototype squad, and his Porsche teammate Neel Jani is here in the Rebellion Racing Oreca. Former Audi R18 driver Marcel Fässler is back with the Corvette Racing team. IndyCar driver James Hinchcliffe just came off feeding bumbling doofus Rick Perry sashays of shame on Dancing With The Stars to drive Mazda’s new prototype. Fellow IndyCar drivers Graham Rahal and Ryan Hunter-Reay are helping drive the two Michael Shank Racing Acura NSX GT3s. V8 Supercars phenomenon and thoroughly insane man Shane Van Gisbergen is racing the No. 50 Mercedes-AMG GT3. There’s also a number of ex-Formula One drivers on the entry list, including Sebastien Buemi, Bruno Senna and Nick Heidfeld. And of course, there’s a slew of old favorites and cool cars, such as Corvette Racing, who took the most entertaining 1-2 finish I’ve ever seen here last year. They had to switch to a spare car for this race after a preseason testing fire charred the No. 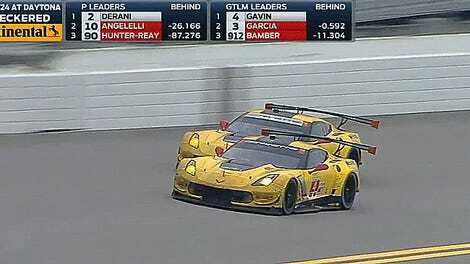 4 Corvette C7.R, but their No. 4 suffered a similar fiery mishap in testing last year and it worked out more than okay at the race itself. Scott Pruett, who is currently tied with racing legend Hurley Haywood for the most number of Rolex 24 wins, is here chasing a sixth win in the GTD-class Lexus RCF GT3 that would make that record all his own. This is also the first time the Lexus will race in North America. Dig through the entry list in more detail here, if you’re curious. When does the race start? Whether you’re here at the track or at home in front of a TV, you’ll want to drop everything for an entire 24 hours starting at 2:30 p.m. ET on Saturday. Do note: the checkered flag drops at 2:30 p.m. on Sunday, so don’t overshoot the ending with a bathroom break thinking they end the whole day at 3. Times were close in qualifying, so this should be a brutal fight to the very end in all four classes. In other words, you’ll probably want to park yourself in front of the TV for the last thirty minutes or so. As in previous years, Fox is pretty serious when they write “All times ET and subject to change” on their broadcast announcement. This is, of course, the network that infuriatingly swapped Le Mans’ broadcast schedule around mid-race to accommodate golf tournament over-runs on one of their other channels. Man, that’s a lot. Is there anything else? Believe it or not, they managed to work in a support race in addition to the Rolex 24: a “short” four-hour Continental Tire Sports Car Challenge race. Out of all the series that ran last year, the CTSCC is the one I had the most fun watching. The cars are a little more down to earth—instead of Porsche 911s, Lamborghini Huracáns and Ford GTs, they race cars like the Mini JCW, Porsche Cayman and Ford Mustang. A McLaren is crashing the party this year, but even that one is the entry-level 570S. Everything is based on a road car, though, foregoing space-age prototypes for the ability to scream WOO PORSCHE because you, too, own that car at the TV. All the cars are kept fairly competitive with each other despite being a collection of different models from different marques, which has led to some hilariously ruthless on-track battles in previous seasons. This year should be more of the same. The CTSCC race starts today at 12:05 p.m. ET, and is streamed in its entirety at imsa.tv. We’re also here this weekend, so at least we can fill in the gaps if something was missed on television, or desperately needs to be seen up-close. Have anything in particular you’d like us to get an up-close look at this weekend? Let us know.